Utilis Corp. has cut the ribbon, officially opening their new United States based subsidiary, Utilis Inc, in San Diego. Utilis is the world’s only leak detection provider that uses satellite remote sensing, which contributes to the conservation of one of Earth’s most precious resources. Utilis selected San Diego for their second outpost due to the availability of quality talent, the strong support for the blue tech sector and the interest in water conservation by the state. San Diego Council Member Mark Kersey with Utilis CEO Elly Perets. Elected officials and representatives from local utilities attended the August 23rd event to learn about new innovation in the leak detection sector and the impact Utilis is making in the global water conservation effort. Guests moved between five stations, covering a short presentation about the company’s history and mission, an overview of their patented technology, previous case studies in the U.S., and finally debuting an upcoming pilot project for the City of San Diego, where Utilis will provide 100 points of interest signifying possible leaks. Guests included San Diego City Council Member Mark Kersey, representatives from the offices of Congressmen Scott Peters, Congressional Candidate Sara Jacobs, and San Diego City Council President Pro Tem Barbara Bry, and organizations such as the City of Oceanside water utilities department, California American Water and SUEZ of North America. The guests were able to interact with Utilis employees, including the CEO, and ask questions. At the end, everyone was treated to a beer tasting provided by San Diego county’s own S.T.E.M. outreach microbrewery, Wavelength Brewing Co., which shares a mutual mission of using space and science to save Earth’s resources. 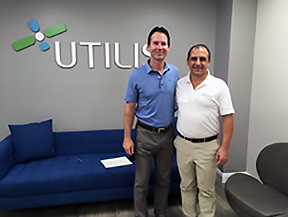 Elly Perets, CEO of Utilis, said that the company is grateful for such a warm welcome by the San Diego community and the firm looks forward to working with local officials and utility companies to find more leaks and save water.